The Coreopsis family consists of about 120 species, and include hardy perennials; annuals and annual perennial(temperennial) ones. Coreopsis are well-known for their abundant and long lasting flowers and therefore attractive and popular border plants; the temperennial Coreopsis even flowers till the frost. By cross-breeding of annual Coreopsisspecies and perennial Coreopsis species, a wide range of new colours came into being and consists of annual; temperennial and hardy varieties. Temperennial Coreopsis is a complete new line of Coreopsis. These are bred by the American breeder, Darrell Probst. Temperennial Coreopsis is not fully hardy and needs to be protected in Winter. This new group of Coreopsis easily can be propagated by taking cuttings. It are fast growing varieties with unusual spectrum of bright flower-colour combinations. Temperennial Coreopsis a is strong garden plant, doing well on pots and is very floriferous. Within the scope of this article, I will describe some hardy species and the new hardy perennial and temperennial Coreopsis. Coreopsis gigantea. Gigantea is a Latin transcription of the Greek word giganteios (gigas-gigantos) which means Giant or Gigantic. The common name of this Coreopsis is: Giant Coreopsis. This species is native in California, reaching a length of 180cm. The stem is woody at the base. The diameter of the light yellow flowers is 3.5 – 4cm. Coreopsis grandiflora from the Latin word grandis(large) and flos(flower) = large-flowered. Common name: Large-flowered tickseed. It is said that Coreopsis grandiflora is the best species for cut flowers. The flower buds will open in water and last up to 2 weeks. This Coreopsis is widely naturalized and endemic in Kansas; Texas and New Mexico. A commendable variety is Coreopsis grandiflora Badengold. It, already, is existing since 1939 and is still in trade. The flowers are 10cm wide and appear from July till September. Coreopsis grandiflora Badengold is completely sterile. The seed propagated, golden yellow variety Sunray produces double, long lasting flowers with a stem length of 60cm. It flowers from may till October!!! Sunray is an excellent cut flower. Another recommended new-comers are: Coreopsis grandiflora Early Sunrise, an All American Award Winner and Coreopsis grandiflora Rising Sun. It is a double flowered one with golden yellow fringed petals and a mahogany-red centre. It is an early blooming variety. Coreopsis grandiflora Flying Saucers is an Plant Haven introduction. It is a sterile variety with golden yellow blossoms. The foliage is dark green and is extremely uniform. Coreopsis lanceolata from the Latin word: lanceöla which is a diminutive of lancéa meaning: lance. The common name is Lance-leaved Coreopsis having lancet-shaped leaves. The native area of distribution is in the middle and east of the United States, in particular Virginia; Ontario; Wisconsin and Missouri. Coreopsis lanceolata flowers in July and August. This species, unfortunately is not as hardy as other species. When having two severe Winters after each other Coreopsis lanceolata, partly does not survive. Coreopsis lanceolata Golden Queen is the most hardy variety. It is very floriferous one with vivid yellow flowers. Other varieties are: Goldteppich(height 25-35cm); Sterntaler(50cm) having brown spots on the golden yellow flower petals. Baby Gold is a bushy, 40cm high lanceolata, very rich flowering and has pure gold yellow flowers. Coreopsis palmate. Palmate derives from the Latin word palma and means: divaricated, hand-shaped. It is a real herbaceous perennial Coreopsis, similar to Coreopsis verticillata, however, taller. It is a long-living species, having a mass of slim and thin rhizomes. The colour of the flower is lemon yellow. The diameter of the flower is 5.5cm. the common name is Stiff-seed Coreopsis. Coreopsis pubescens. Pubescens comes from the Latin word pubescëre which means: becoming mature; reach maturity; hairy or downy hairy. The common name is Star Tickseed. Coreopsispubescens can be found in open woods and gravely streams; even on rocky ledges. Coreopsis pubescens naturally prefers half-shade.It flowers from May till end of September, the stems remain green till December and still can show flowers now and than. Coreopsis pubescens Sunshine Superman is a selection from the American native species and blooms all season. Coreopsis rosea. Common name is Pink Tickseeed.Rosea refers to the Latin word rosa which means: rose; rose-red or pink. Coreopsis rosea is native in North America…Massachusetts to Maryland. The species is quite rare and is seldom offered. It is in trade as Coreopsis rosea Nana. This is not a new variety, but the ‘named’ species! Really new is Coreopsis rosea Heavens’s Gate. It has rose-pink flowers with a darker eye around the yellow centre. It is a mutation of Coreopsis rosea Sweet Dreams. The diameter of the flowers is about 2.5cm. Coreopsis rosea prefers a sunny and a dry site. Coreopsis tripteris. Tripteris derives from the Latin name tri= three times (in compositions) and piéron which means: wing. tri-piëron three wings or with three leaves. The common name is Tall Tickseed. It isstrong and a robust plant, reaching a length up to two meters. It is a long-living perennial; easy to grow and blooms July till September. Coreopsis verticillata from the Latin word verticillus and means whorl or whorled. The common name is Threadleaf Coreopsis or Whorled Coreopsis or Moonbeam Coreopsis. Coreopsis verticillata is the most popular Coreopsis among the species. Not only for its beautiful stellate(star-forming) flowers, but, in particular, because it is a very strong species compared to the others and requires less care. Coreopsis verticillata is native in the middle and the east of the USA. Coreopsis verticillata already was brought into cultivation in the United Kingdom(England) in 1759. The height is about 40-60cm. The plants forms underground stem suckers or rhizomes. Coreopsis verticillata bears an abundance of yellow flowers from June till September. It is a satisfying border plant. Well known varieties are. Coreopsis verticillata Grandiflora; the very popular variety Coreopsis verticillata Moonbeam, having soft yellow flowers and the dwarf one Coreopsis verticillata Zagreb. Zagreb is exceptionally tolerant of dryness. New introductions are: Créme Brulee. It is similar to Moonbeam but has larger flowers and is improved mildew resistant. Golden Gain and Golden Showers are very floriferous new comers producing an abundance of golden yellow flowers on strong sturdy stems all Summer. Coreopsis verticillata Sunbeam is a darker golden yellow mutation of Moonbeam with grey-green, threadlike foliage. Blooms of Bressingham was founded in the early 50’s of last Century by Alan Bloom. Alan Bloom became a gardener from the age of 16. He is famous throughout the world for his new introductions of plants and ideas for garden design. Alan’s passion for Hardy Perennials is proverbial. Two of his first introductions are Achillea Moonshine and Crocosmia Lucifer which are still amongst the top sellers nowadays. In 1970, the company was taken over by his sons Robert and Adrian. In the meantime the third generation is running the company. During the years passed, Blooms introduced plenty of new varieties and won many Chelsea Gold Medals!! CRÈME BRULEE; GOLDEN GAIN; LIMEROCK DREAM; LIMEROCK PASSION; LIMEROCK RUBY and COROPSIS ROSEA SWEET DREAMS. The company ItSaul Plants is popularly called ‘the Saul brothers’. Robert(Bobby for friends) and Richard Saul started their company over 20 years ago in Atlanta, Georgia, USA. Initially, they established their company to supply the local landscape market. Nowadays the Saul family runs 3 companies. Saul Nurseries Inc. a wholesale nursery, supplying professional landscapers. ItSaul Natural. A soil company with a line of organic soil products , offered under the name ‘Mr. Natural’. The Saul brothers became famous for their ‘BIG SKY’ Echinicea introductions such as Harvest Moon; Sundown; Sunset; Sunrise etc. They also have introduced the multicoloured AJUGA ‘DIXIE CHIP’. Bobby and Richard, in the meantime, has brought over 50 new introductions on the market. many new introductions may be expected in the near future. Successfully introduced Coreopsis varieties are: JETRO TULL ( a cross between Early Sunrise and Zamfir); ZAMFIR and ROUTE 66. The company was founded in 1997 by Geoff and Maureen Needham. PlantHaven does not breed or grow plants. They even do not have any interest in setting up a nursery or breeding program. PlantHaven is an independent agency, assisting plant breeders world-wide in bringing their new varieties to the market. They work on a ‘commission on royalties’ basis under the Trade-mark ‘From Breeder to Market’. Before they introduce a new variety, the variety is widely tested in the different climate zones. PlantHaven has introduced COREOPSIS FLYING SAUCERS bred by the English plantsman David Tristram. It belongs to the grandiflora group. Compared to other Coreopsis grandiflora cultivars, Flying Saucers has a more uniform and compact growth habit with better branching. The variety is doing well as a container patio-plant. It blooms continuously. Sunny Border Nurseries was established by Robert Bennerup, a Danish plantsman who immigrated to the ‘promised country’ the USA in 1925. He started a small nursery in 1929 in Bronxville, north from New York City. In 1937 he moved to Norwalk, Connecticut and established Norwalk Perennial Gardens, but because his company had outgrown the land, Robert bought in 1945 a large farm in the middle of the State Connecticut and changed the company name into Sunny Border Nurseries Inc. Sunny Border has introduced many new varieties on the market since its foundation. The most successful introduction is undoubtedly Veronica Sunny Border Blue. This cultivar is over 50 years on the market and is still a valuable; popular and well sold variety. Since the company was taken over by Robert’s son Pierre Bennerup and Marc Laviana, the company is expanding constantly. Sunny Border has introduced two Coreopsis varieties so far. COREOPSIS ROSEA HEAVEN’S GATE. This is a hardy selection of Coreopsis rosea Sweet Dreams. COREOPSIS VERTICILLATA SIENNA SUNSET. It is a mutation of Coreopsis Crême Brulee. The colour of Coreopsis Crême Brulee is soft yellow while Sienna Sunset has rich burnt sienna coloured flowers. It really is an exiting colour break-through. Van Hoorn Nurseries is run by Jim Van Hoorn. His grand father emigrated from Holland to the USA in 1920. the nursery is located in Marengo, Illinois, USA. It is a middle-size company, employingabout 35 employees. This company is famous all over the USA for its high quality of Hosta. They are known as ‘The Hosta People’. They grow a lot of other hardy perennial varieties as well…Ornamental Grasses; Astilbe; Geranium; Hemerocallis; Heuchera; Iris etc. an Hoorn Nurseries has one exclusive Coreopsis cultivar. It is COREOPSIS TRIPTERIS FLOWER TOWER. This variety has tick stems with dark green, leathery leaves. 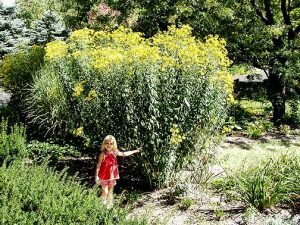 It reaches a length of over 2 meters, having on top large bouquets of golden-yellow flowers and is a vast improvement over the species with stems that are 2-3 times thicker. It does not fall down like the tripteris species. It is overall more robust. Coreopsis tripteris FlowerTower is a superb use as a privacy screen or natural fence. It is an eye-catcher solitary as well. WaltersGardens was founded in 1946 by Harriet Knoll and Dennis Walters under the name Knoll & Walters Perennials. Harriet was the only child of Dena and John Knoll.John Knoll passed away at a very young age in 1936. Despite the sad circumstances, Dena decided to carry on. In 1942, she hired a young man, Dennis Walters. He married Dena’s daughter Harriet in 1946. 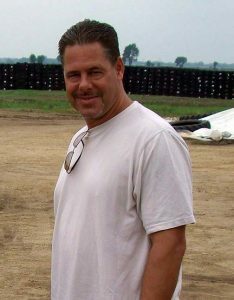 When Dena retired a few years later, Dennis hired his four brothers –Harold; Henry; Jason and Floyd to help with the expanding business and Walters Gardens Inc. was born. As I am going to write a separate article about the interesting story of‘North America’s Leading Wholesale Grower of Perennials’, I confine now to the subject of this article: COROPSIS. WaltersGardens has introduced 2 new Coreopsis cultivars. COREOPSIS VERTICILLATA MOONRAY. It is a selection from Coreopsis verticillata Moonbeam, it however has light creamy flowers. It has a vigorous habit and is a long blooming one. To write something about Darrell as a person, is hardly possible. He,actually, is more or less an eccentric person; a little bit unresponsive; he tries to avoid to be in the centre of attention, Darrell, in fact, shuns publicity as much as possible. When selecting his cross-breeding seeds, he firstly looks to the moon and the stars. When the position of the moon is in conformity(harmony) with the position of the stars, he than start selecting his seeds! Though Darrell is known as the best expert in the world where it concerns Epimedium, he is not devoted on one genus only, on the contrary. He also went to search for ‘new’ things to propagate and to sell.He. Successfully has bred new varieties of Gentiana; Lychnis; Miscanthus; Pardancanda; Physostegia and Tricyrtis. Darrell has developed a complete new line of Lobelia too. 15 varieties have been selected until now. They are tetraploid and fully hardy! The nursery of Darrell may be found in the middle of a wood of a small settlement(hamlet) in Massachusetts, USA, called Hubbardston. It is on this place where he is so succesfull in breeding Coreopsis. 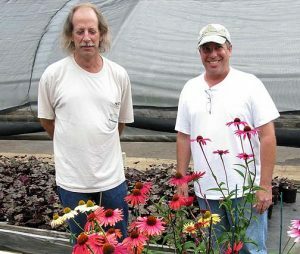 It was 8 years ago when Darrell started his Coreopsis breeding program. Though a wide range of varieties was available in practically all the species, he was not satisfied with the colour range….yellow; soft yellow; lemon yellow; orange yellow, sometimes having a red centre or brown flecks, but what about real pink real purple; real bright red; real orange; bi-colours and so on!! Darrel began to cross- breed 8 different species, the annual Coreopsis tinctoria included. Tinctoria derives from the Latin word tinctor…tingére which means painting; painter; used by painters; used as a paint. The use of Coreopsis tinctoria was logical for getting new colours. A famous English horticultural journalist wrote: 25 Coropsis varieties from the cross-polinating paintbrush of Darrell Probst will be offered the years to come!! And so it is. All the new varieties look if each individual variety has been painted by an artist. But how to get hardy plants ifthe annual Coreopsis tinctoria is breed in. Darrell of course also has asked himself this question. The fact is that Coreopsis already flowers the first year from seed, so, the best way was to let the plants hibernate in the open field. Only the strong(er) plants will survive. And it is known that, in the area where Darrell lives, it is far colder than in Europe. Minus 20-30 degrees Celcius for a long period is quite usual in Massachusetts. To get sufficient hardiness is just a matter of continuing the cross-breeding with the survived plants. About a dozen, out of the 25 varieties mentioned are hardy; the rest is semi-hardy. But is it a problem if not all are hardy? The above mentioned journalist quoted: but as more and more Coreopsis appear on the market –some tough as nails, some more like annuals for summer containers- we need breeders and nurseries to be open and realistic about the hardiness of these plants. It’s not that we won’t grow those that are less hardy, we just need to know’, so that we can grow them in an appropriate way and our expectations are not dashed. And that’s why Darrel distinguishes his Coreopsis breeding results in 2 different groups: the hardy ones and the semi-hardy ones. The Coloropsis series is a semi-hardy series. It are temperennials which means: annual perennials. Such varieties do need to be protected in Winter. The reader might not understand what, actually is meant with temperennials, but to clear it up: Fuchsia and Pelargonium are temperennials, or annual perennials. In Winter, they will not survive in the open, but could live many years if protected in Winter and if given sufficient care. And so it is with Darrell’s Coreopsis COLOROPSIS SERIES and itsSWINGING COLOURS. The colours are unique. From 2009 on the following varieties will be introduced: BOLERO; CALIENTE; CHA CHA CHA; JIVE; LIMBO; MAMBO and SALSA. The Coloropsis hybrids cultivars bloom from May till late October. 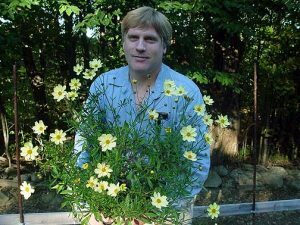 ‘TOUGH AS NAILS AND EXCELLENT HARDY’ wrote, the already cited horticultural journalist about Darrell’s Big Bang series. ‘THEIR BACKGROUND IS COMPLECATED. THE PLANTS IN THIS SERIES ARE HYBRIDS INVOLVING EIGHT DIFFERENT SPECIES AND HAVE BEEN EIGHT YEARS IN THE MAKING. THEY PRODUCE A LONG SUCCESSION OF FLOWERS, WITH FOLIAGE BETWEEN THAT OF COREOPSIS VERTICILLATA AND COREOPSIS GRANDIFLORA’. A dozen out of 25 are hardy. And it is because Darrell wants to be sure for 100% that his selections are hardy that until now only 2 varieties out of 12 are offered. It are the varieties COREOPSIS HYBRID FULL MOON andCOREOPSIS HYBRID RED SHIFT. Coreopsis Red Shift starts flowering in June, having yellow flowers with a red edge. The flowers discolour step by step when aging. In Autumn, the flowers are red completely. Additional 2-3 varieties of the Big Bang Series will be introduced in 2009, as well as a new variegated Coreopsis pubescens, named: Fools Gold. Darrel Probst, the eccentric breeder, did a good job. Thanks to him the garden future will be coloured with a constant flush of high valuable new varieties. Hopefully Darrell allows me to cast an eye on his Lobelia breeding program next year so that I may surprise the readers with an interesting and colourful article about Lobelia.